Over the last month, TransLink’s Compass Card roll out has been ramping-up. According to recent media reports, about 22% of all monthly pass holders have transitioned to the Compass Card. CNIB clients, U-Pass holders, and people that have a subsidized BC Bus Pass are also using the Compass Card. 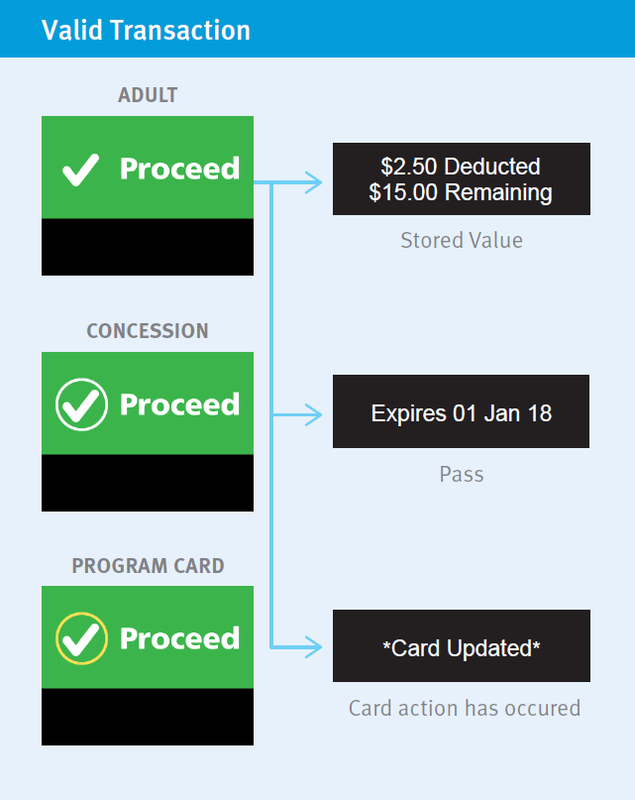 December is the last month that people can purchase paper monthly passes, so all pass holders will be switched over to the Compass Card in January 2016. The next phase for TransLink will be the discontinuation of the paper FareSaver tickets likely by the summer of 2016. As everyone knows, the Compass Card program was delayed because of problems with people tapping on the bus. While there are certainly issues with tapping out due to a lack of readers which impacts people exiting busy buses at a major stops, most of the problems were due to people not knowing how to tap properly. At the beginning of the month, people where waving, swiping, and doing all sorts of non-tapping things with their Compass Cards, making it hard or impossible for the reader to register their cards. As this month comes to a close, people have gotten used to just holding their card at a reader until a check is displayed. Speaking about checks, there are a several different messages and icons that appear when presenting a Compass Card at a reader. Besides the general idea that a check plus green was good, and an “x” plus red was bad, I had no idea what some of the messages were as they flashed up so fast. TransLink recently posted a Compass Card instruction guide to its website. 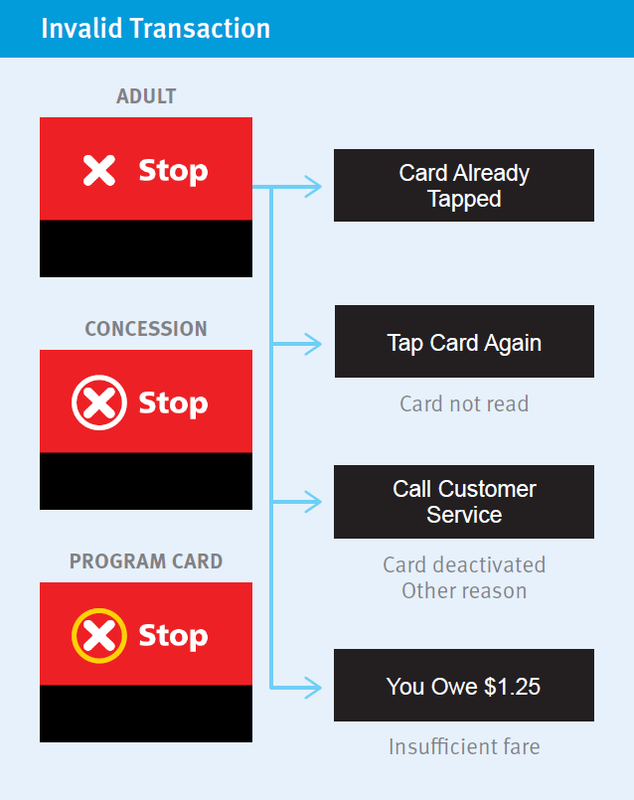 The guide contains an explanation of the different messages that you’ll see when presenting a Compass Card at a reader. 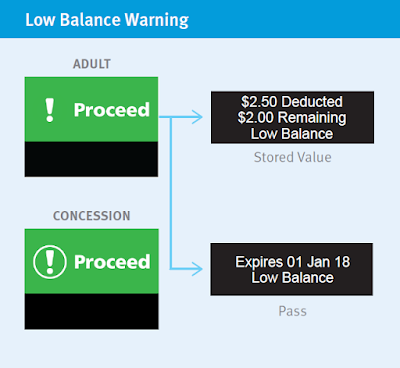 What you'll see if you need to top-up your Compass Card. When everything is great, you'll see these messages on the Compass Card readers. From a customer perspective, the Compass Card roll-out has been going well. It will be interesting to see how TransLink will deal with people that pay with cash on the bus and received a ticket that won’t open faregates (tickets issued on buses don’t work with faregates), once all the faregates are fully operations along the SkyTrain network. This week, I have been posting about the trip that my friend Paul Hillsdon and I took on the new BC Transit Fraser Valley Express/66X on the weekend. 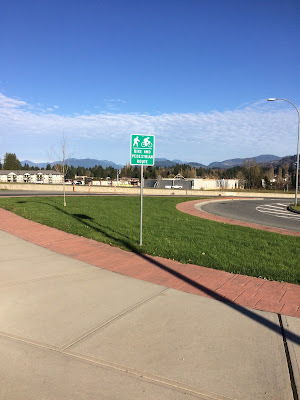 In part 1, we journeyed from the Carvolth Park and Ride to Downtown Chilliwack. We then travelled back to the McCallum Road stop in Abbotsford. 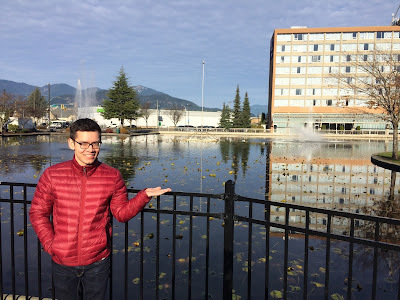 In part 2, we meet up with Patrick Oystryk, a planner with the City of Abbotsford who is working on Abbotsforward, and walked along McCallum Road to Historic Downtown Abbotsford where we had lunch. Today is the final installment of this series. While Paul, Patrick, and I were having lunch in a 100+ year old building in Downtown Abbotsford, we started talking about the history of the area. One of the things that I noticed was that while Downtown Abbotsford has some very old buildings, over the years many have been altered in such a way that you wouldn’t know their age. Abbotsford has a rich history that predates the arrival of colonizers, and even has an interesting colonial history. For example, the community is home to the oldest existing Sikh temple in North America, the Gur Sikh Temple. Present day Abbotsford was two municipalities up until 1995: the District of Matsqui and the District Municipality of Abbotsford. The word Matsqui is derived from the Halkomelem language and means a "stretch of higher ground." Abbotsford was named to commemorate a guy named Harry Braithwaite Abbott and some castle in Scotland. I don’t know if I’m reading too deep into this, but it is interesting that Matsqui wasn’t chosen as the name for the merged municipality. After chatting about the history of Abbotsford, we started talking about growth in Abbotsford. Patrick told us that many people have the assumption that Abbotsford is growing at a fast pace. This was true in the past, but that growth has slowed significantly over the last decade. Another assumption about Abbotsford is that it is a sprawling city. This is actually not the case. As urban Abbotsford is bound by the Agricultural Land Reserve and Sumas Mountains, the only way that Abbotsford can grow is up. After lunch, we decided to make our way to the High Street mall. 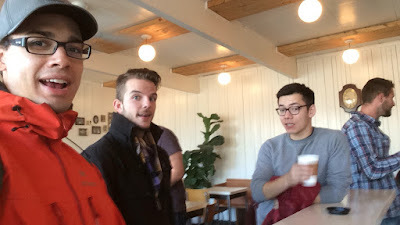 Patrick was also really keen on taking us to Oldhand Coffee, a hipster coffee joint, which was along the way. Our plan was to take the 2 Bluejay – Huntingdon, another one of Abbotsford's “frequent” transit routes that runs every 30 minutes. As we were waiting for this bus, and for subsequent buses, it became apparent that the bus schedule was more of a suggested arrival time. Every bus we took in Abbotsford was late by at least 10 minutes. South Fraser Way is the main east/west commercial road through Abbotsford. It is also in the centre of urban Abbotsford. 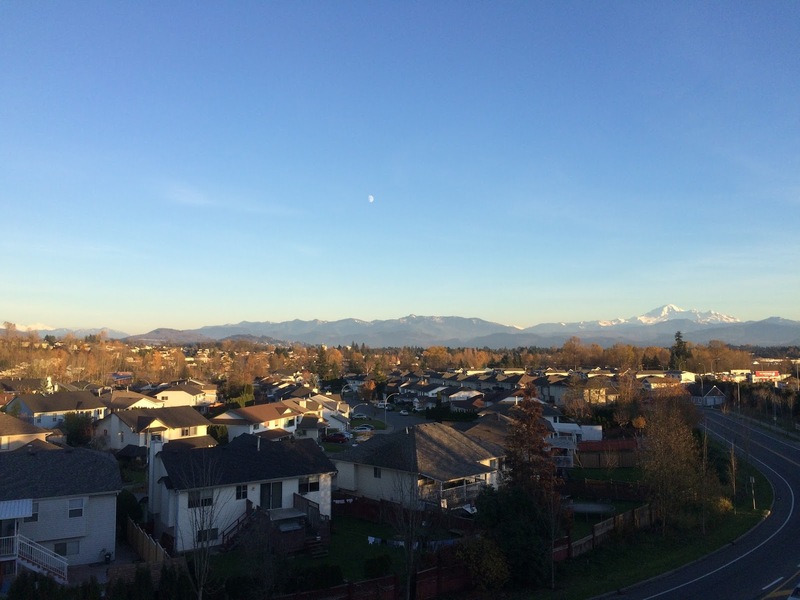 A large percentage of Abbotsford’s population is about a 15 minute walk from South Fraser Way. The urban form is a mix of strip malls, regular malls, big box, offices, and even buildings that front the street. I wouldn’t want to walk on that street today, but the road reminded me of pictures I saw of Vancouver’s Broadway back in the 1970s. If Abbotsford is able to transform the built-form of South Fraser Way, it has the potential to create a great transit street like Broadway in Vancouver. After coffee, we boarded another 2 towards High Street. High Street is a mall at the edge of town, and is a popular destination for both people in Abbotsford and Langley. The traffic jam around the mall was insane. 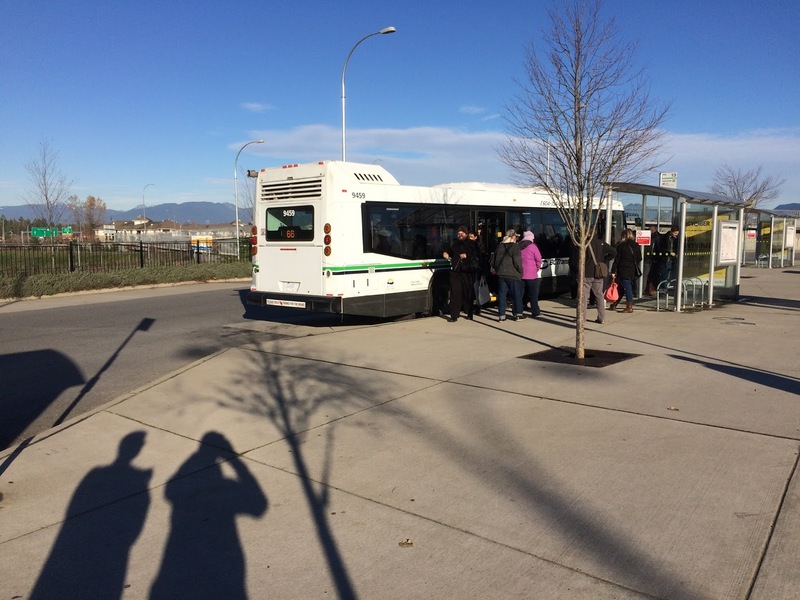 Because there is no bus prioritization in Abbotsford, buses get stuck in traffic. This meant that Paul and I missed our bus back to Langley; we had two hours to kill at High Street. We ended up going to one of the restaurants in the mall after wondering around High Street for a bit. If you want to know my views about High Street, check out an earlier post I did. Paul and I checking out the Christmas decorations in High Street. Select image to enlarge. 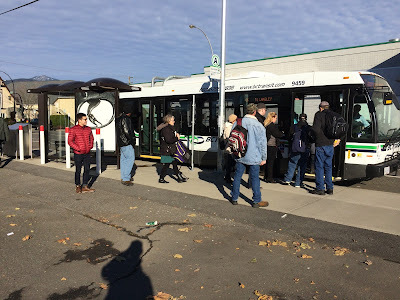 When it came time to catch the 66X back to Langley, Paul and I headed to its bus stop. We waited, and waited, then waited some more. We wondered if the bus was coming. In Metro Vancouver, there is real-time bus information that lets you know exactly where buses are. There is also a customer service department that can help you out. In Abbotsford, there is no real-time bus information, and customer service doesn’t have the best hours. The bus did come, but it was 30 minutes late. This was due to an accident on Highway 1. There is nothing more frustrating than waiting for a bus that runs every 2 hours, and having no idea where it is. In Metro Vancouver, we really take for granted all the tech that makes taking TransLink easy. Looking east from High Street. There is a city in there somewhere. Select image to enlarge. If I'm heading out to Abbotsford or Chilliwack in the future, I will take the 66X again. It was really great of Patrick to take time out of his schedule to tour us around Abbotsford. For all those Vancouver urbanists that dismiss the Fraser Valley, you should take note. Good things are happening here, but it will take gentle nudges to ensure things move along the path of livability. Yesterday, I posted about the first part of the journey that Paul Hillsdon and I took along the Fraser Valley Express/66X on the weekend. After our brief stop in Downtown Chilliwack, Paul and I boarded the 66X back to Abbotsford. We disembarked at the McCallum Road Park and Ride, just south of Highway 1. The journey took around 35 minutes. 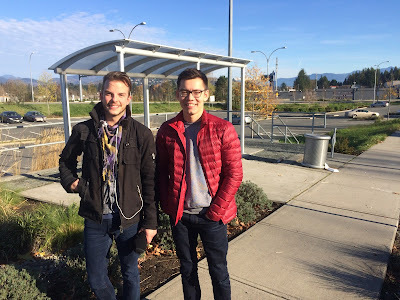 Patrick Oystryk, a planner with the City of Abbotsford, met us at the Park and Ride. One of our first orders of business was to catch a local BC Transit bus to Historic Downtown Abbotsford to have lunch. Patrick and Paul at the 66X bus stop at McCallum Road. Select image to enlarge. We were going to take the 3 Clearbrook – UFV. This route is marketed as a “frequent” transit route. I say “frequent” because service is every 30 minutes most of the day with every 15 minutes service during weekday peak periods. In Metro Vancouver, we would call this a regular bus route. True frequent transit is 15 minutes or better service all day, every day. The perfect example is the 502 which I take along Fraser Highway. During peak periods, there is a bus every 5 minutes with off-peak service every 15 minutes. Interestingly, the number 3 doesn’t stop at the same bus stop as the 66X. One of the other odd things I noticed about Abbotsford’s transit system was that its bus stops are mid-block. They are not at intersections like in Metro Vancouver which helps people transfer between routes, and get to their preferred side of the street safely. At the McCallum Road interchange, people walking and cycling are forced to share a small sidewalk. Select image to enlarge. I asked Patrick about Abbotsford’s mid-block bus stop configuration. He told me that this was to done to reduce the delays that buses may cause to people driving their personal automobiles. This is very different to how transportation planning is done in cities like Surrey. As you may imagine, this bus stop configuration causes people to cross roads without using crosswalks. Unfortunately, we just missed the bus by a few minutes. Missing the 3 foreshowed other challenges we would experience with Abbotsford's transit system throughout the day. Because we missed the bus, Patrick, Paul, and I decided to walk from the Park and Ride to Downtown Abbotsford. This was actually a great walk, even if we had to squeeze between utility poles that were installed in the middle of the sidewalk along McCallum, because Patrick was able to tell us about the Abbotsforward Official Community Plan update process. Most communities that update their Official Community Plan do public outreach as part of the update process. Most of the time, this involves a municipality advertising that people should attend one of their events. Because Abbotsford wants this plan to truly represent the vision of all people who live in the community, instead of expecting people to come to city events, the City has come to them. 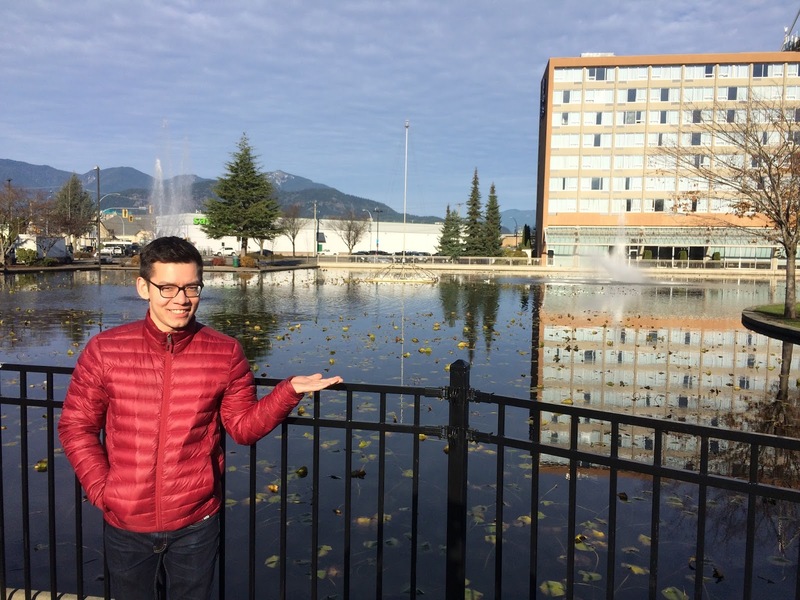 Patrick told us that he has been all over the community, reaching out to residents, and getting their feedback about what they would like future Abbotsford to look like. Because the City of Abbotsford has decided to reach out to the community, Patrick told use that the feedback has been amazing. One of the other cool things about the Abbotsforward plan is that it is based on how the community should look like, and what services should be available, based on certain population targets. Most Official Community Plan are based on year targets. For example, it makes more sense to plan for an expanded community center when the population increases by 20,000, then to expand a community centre just because it happens to be 2020. It also makes more sense to plan a transportation network based on population as well. I’m looking forward to seeing the Abbotsforward plan adopted by Abbotsford City Council because I believe it will move Abbotsford forward, along the path of sustainability. Paul, Nathan, and Patrick: a selfie in Downtown Abbotsford. Select image to enlarge. After about 20 minutes, Patrick, Paul, and I arrived in Downtown Abbotsford for lunch. Tomorrow, I will be posting about our adventure getting from Downtown to the High Street Mall on the other side of town via BC Transit. 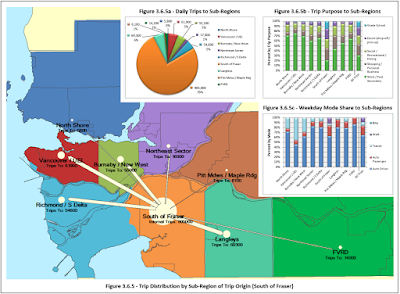 Over the past decade, transit service between the Fraser Valley Regional District and Metro Vancouver has greatly improved. Before 2007, there was no public transit available between Langley and Abbotsford, even though there is a large number of people that travel between those two communities. In the fall of 2007, BC Transit started providing bus service between Aldergrove and Abbotsford. I posted about my experience taking that service back in 2012. This spring, BC Transit launched the Fraser Valley Express/66X which links the Carvorth Park and Ride in Langley, with Abbotsford and Chilliwack. On Saturday, my good friend Paul Hillsdon and I decided to check out this new service. Fraser Valley Express route. Select to enlarge. Along the way, we met up with Patrick Oystryk. He is working on Abbotsforward. Abbotsforward is the name of Abbotsford's Official Community Plan update project. One of the first things I noticed at Carvolth was the demand for the 66X service. There was a lineup of people waiting to get on the bus. People waiting to board the 66X at Carvolth Park and Ride. Select image to enlarge. Metro Vancouver’s, Abbotsford’s, and Chilliwack’s transit systems all have different fares, tickets, and passes. The 66X also has its own fares, tickets, and passes. No transfers are issued on the 66X. If you were a regular user of this service between Abbotsford and Langley, you would have to have a Compass Card, a 66X pass, and an Abbotsford transit pass. One of the major reasons why regions in Canada and the US switch to smart card systems like the Compass Card is because it allows people to load up passes and an e-purse which can be used on disparate systems. 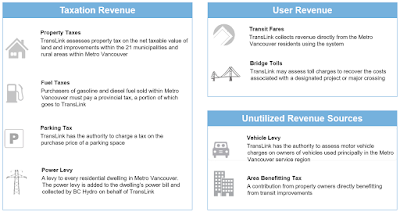 Having the Compass Card as a form of payment on the 66X, and in the future on other Fraser Valley transit systems, would greatly improve the travel experience for all transit users. One of the first things that Paul noticed was that unlike TransLink which uses highway coaches on long-distance or routes that primarily run on freeways, the 66X is a regular urban transit bus. I told Paul that he was just spoiled with TransLink service, but the truth is that a highway coach would actually be a better fit for the 66X service. 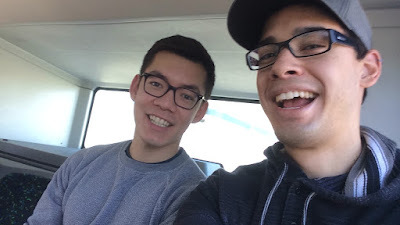 A bus selfie with Paul and me. Select image to enlarge. When I was a kid, I used to take the Vernon transit system everywhere because my mom refused to drive a car. I guess because she spent her years as a young adult in London and Montreal, she found driving to be uncivilized or something. Anyway, I was a bit surprised to see that the rider guides have not changed in 25 years. I noticed that many people on the 66X didn’t find them the most user-friendly. 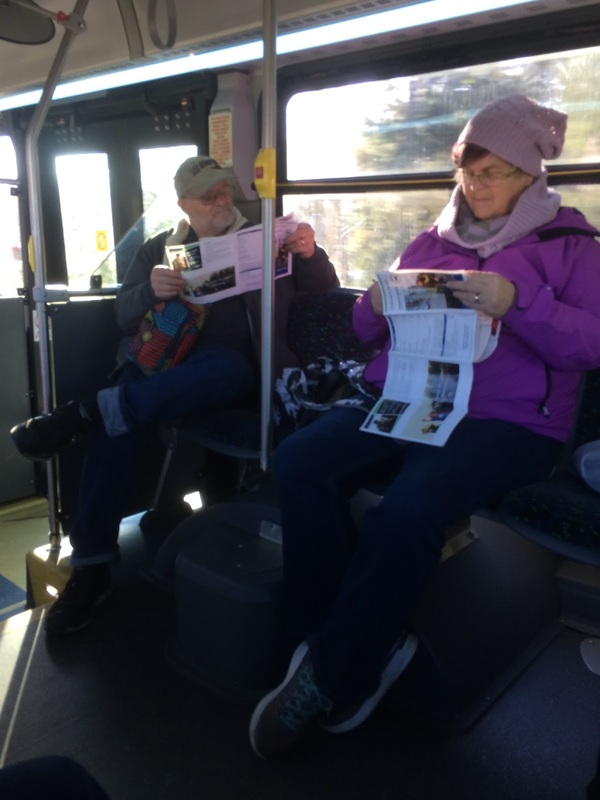 Riders confused by the BC Transit Rider Guide timetable. Select image to enlarge. Paul and I decided to take the 66X all the way to Chilliwack, before heading back to Abbotsford to meet up with Patrick. It took us a little over an hour to get from Carvolth to Downtown Chilliwack. Paul standing in front of the 66X in Downtown Chilliwack. Select image to enlarge. Many Vancouver-types believe that the Fraser Valley is nothing but single-family homes and urban sprawl. This isn’t actually the truth. 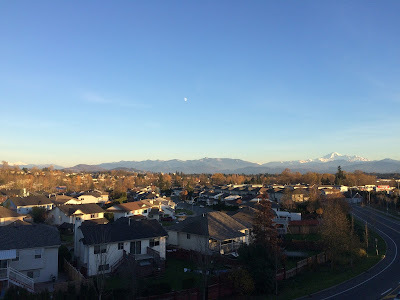 Just like the City of Vancouver, Fraser Valley communities have tracks of single-family housing, but townhouses and apartments are dominant dwelling types throughout Metro Vancouver and the Fraser Valley. I think that even Paul was a bit surprised at the amount of apartments and townhouses in Chilliwack. While housing in the Fraser Valley is compact, the majority of retail spaces are still very much auto-oriented. The good news is that these auto-oriented retail areas can be turned into mixed-use town centres in the future. If you take the SkyTrain through Burnaby, you can see how shopping malls and strips malls are being transformed into fully-functional town centres. Paul at Salish Park in Downtown Chilliwack. Select image to enlarge. Paul and I spent about 20 minutes in Downtown Chilliwack before we boarded the 66X back to Abbotsford. People boarding the 66X in Downtown Chilliwack. Select image to enlarge. 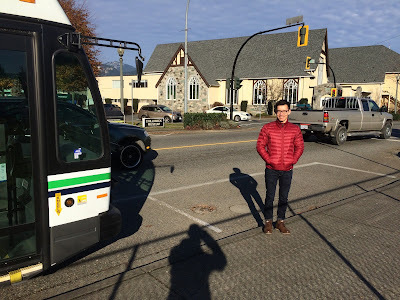 Tomorrow, I will post about our walking and transit adventure through Abbotsford with Patrick. Over the past decade, the City of Surrey has changed from your typical edge city to a municipality that is becoming more forward thinking with how it develops, provides services to residents, and addresses complex issues facing the community. The aim of the summit is to bridge the knowledge gap that can sometimes exists between local government, residents, non-profit service organizations, academia, and the business community. Hopefully what is learned at the summit will be applied on-the-ground in Surrey. The summit takes place tomorrow between 7:15am and 2:15pm at Surrey City Hall. The registration fee is $149.00, but it is reduce to $50.00 if you are a student. Around the world, social innovation is being called upon to help provide novel solutions to social problems that are more effective, efficient, just and sustainable. The Summit’s opening panel will help define and decipher some of the latest thinking about social innovation, its reach and limitations, and how it can help a progressive city such as Surrey reach its potential. City administrations face a unique set of modern challenges on social, environmental and economic fronts. In these increasingly complex times, social innovation is a new asset as citizens, business and not-for-profits work alongside city governments to help provide more sustainable solutions to day-to-day problems. Going it alone is no longer a viable solution for any level of government, particularly municipalities where the ties to the daily lives of citizens is strongest and most pronounced. How is Surrey engaging citizens and organizations in the search for solutions, and what can we learn from other cities? From student energy and ingenuity to world-class research, universities represent key agents of change in our communities. How can they work in alignment with city goals to help design, test and support impactful responses to social and economic challenges? This session explores three unique approaches and hears from students, the community, city staff and university leaders. To build a progressive, resilient city, Surrey needs to engage across sectors, neighbourhoods and individual interests. Finding and nurturing new ideas that can make a difference are key to achieving real change. The Summit’s final session talks with “disruptive innovators” driving new ideas, “bridging innovators” that help spot and move great ideas to the mainstream, and “receptive innovators” that know how to influence whole systems and take good ideas to scale. David Podmore, Chairman & CEO, Concert Properties Ltd. If you have time tomorrow, you should attend this summit. Many municipalities in Metro Vancouver have developed wayfinding strategies for their communities. When it comes to cycling, I know that the City of Surrey has spent considerable time and money marking its cycling network. 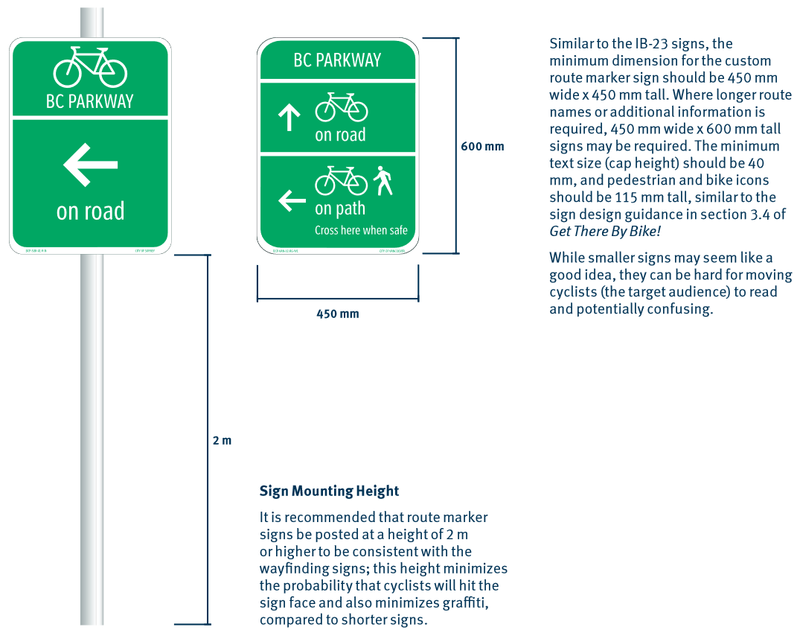 The Township of Langley has been rolling out signage to identify cycling routes within the community. The City of Langley has a comprehensive, multi-modal wayfinding system which it has been slowly rolling out. Even the Ministry of Transportation and Infrastructure has been installing cycling route markers and directional signs on the road network it maintains in our region. While it is great that all levels of government have been rolling out their own versions of cycling wayfinding, there are some issues with this ad-hoc approach. One issue is that cycling route markers are not consistent throughout the region. For people driving and cycling, it can make it a challenge to know if you are on a bike route. For example in some municipalities, the signage is way too small. 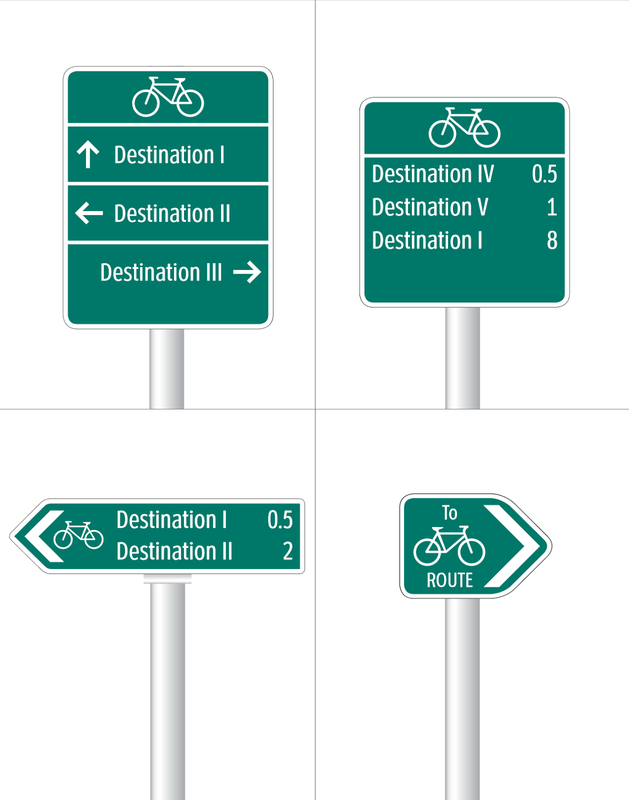 Another challenge is that most municipality’s wayfinding strategies don’t included signage to help people cycling know that they are on the right route to their indented destination. In the fall of 2013, TransLink quietly released “Get There By Bike! 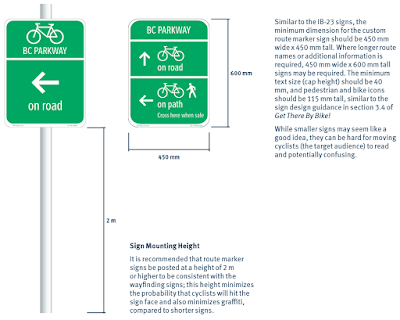 Wayfinding Guidelines for Utility Cycling in Metro Vancouver”. 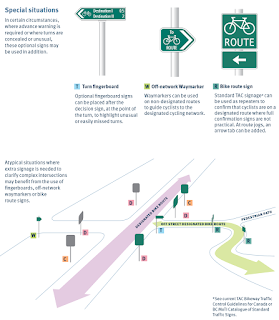 Similar to the MassDOT Protected Bike Lane Guide, the TransLink guide is the bible for cycling wayfinding in our region. The system includes both signage and pavement markings. 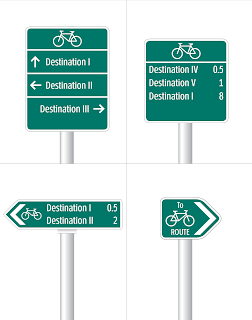 Instead of describing the wayfinding system, the following small selection of examples from the guide show how comprehensive it is. Top left, decision sign. Top right, confirmation sign. Bottom left, turn fingerboard. Bottom right, off-network waymarker. 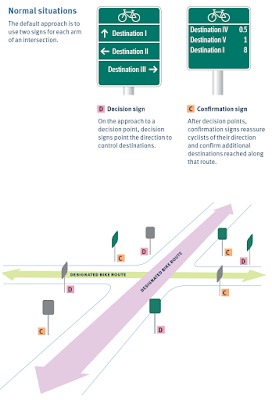 An example of how cycling routes would be signed at a typical intersection. Select image to enlarge. An example of how cycling routes would be signed at a complex intersection. Select image to enlarge. 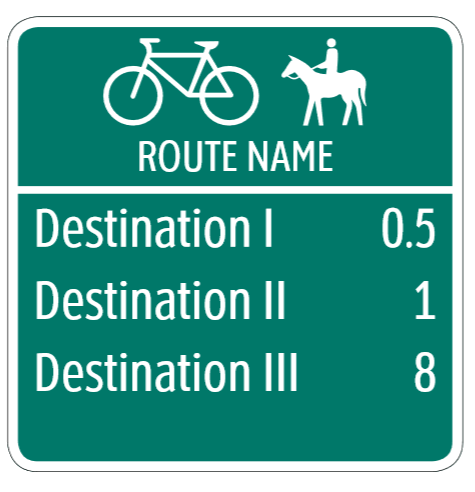 The Township of Langley-friendly cycling and horse riding route marker. Since the guide was released, TransLink has been updating it. Last month, TransLink added a new sign style to its wayfinding system. Named cycling route sign where multiply routing options are available. Select image to enlarge. While I’m happy that TransLink has developed this guide, as implementing the wayfinding system in the guide in optionial for municipalities, I wonder if TransLink's wayfinding system will be incorporated into the wayfinding strategies and systems of our communities. I certainly hope so. Last week I posted about the Massey Bridge. I posted that back in the 1950s, the province decided to build a tunnel because a bridge didn’t make sense to construct for a host of good reasons. It is critical that we look back to history, so we understand why things are the way they are. This knowledge can hopefully help us make better decisions today. While looking at history is important for making decisions today, just because something was a good idea back in the day, doesn’t mean it is a good idea today. I’m sure you can think of at least three things that we thought were good ideas back in the 1990s which we don’t think are good ideas today. In transportation planning, the same holds true. 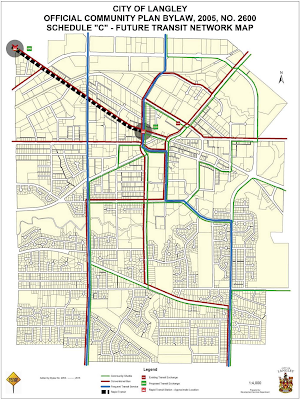 For example if Fraser Highway expansion happened back in the 1990s, there would be no sidewalks, multi-use trials, or bike lanes along the full corridor. Back in the 1990s, you also wouldn’t have seen roundabouts being installed as the preferred intersection choice like they are today. In the 1990s the Canada Line wasn’t even on anyone's radar, yet it has proven to be one of the most successful rapid transit lines in the region. This is why I get frustrated when projects are being built based on plans from 20 years ago, just because they were in plans 20 years ago. Does it really make sense to build a highway through New Westminster in 2015? It was planned for in 1993, but New Westminster and our region is a very different place now. Bulldozing Downtown New West and ripping up their waterfront park for a highway is something governments would have done in the past, but is something we won’t even consider today. A few nights ago, I was using the Internet Archive’s Wayback Machine and found the BC Transportation Financing Authority’s website from 1997. This organization was merged back into the BC Ministry of Transportation and Infrastructure by the BC Liberal in the 2000s. 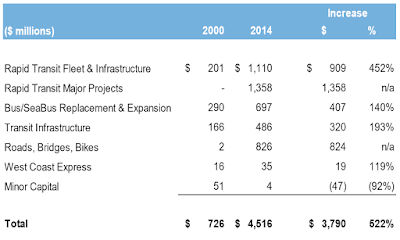 I found a document called “Lower Mainland Highway Improvement Outlook”. This outlook is based on a transportation plan written in 1995. This 20 year old highway plan is what the BC government is still using to build transportation infrastructure in Metro Vancouver today. I have to wonder if the provincial government will actually try to build a freeway through New Westminster, or a new bridge between Marine Drive and Highway 91. The unfortunate reality of building a transportation network based on information from 1995 and earlier is that the billions spent on these projects won’t actually help the vast majority of people get around. 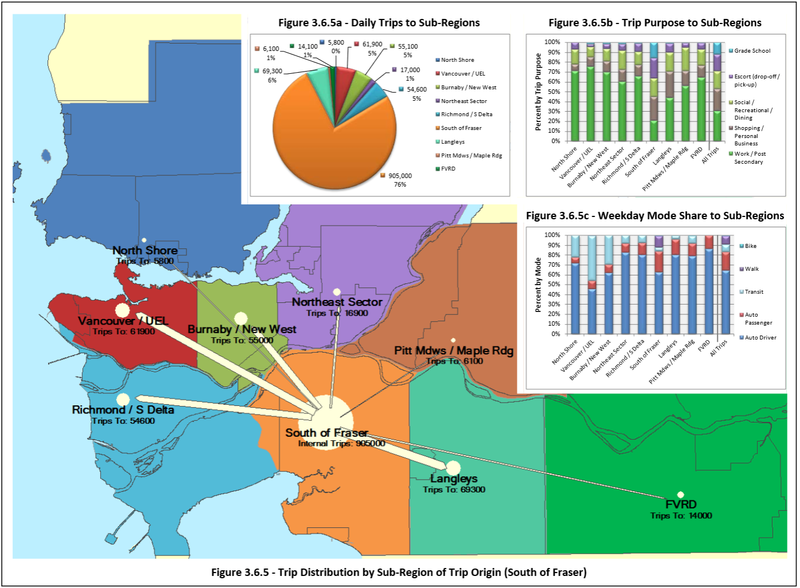 Trip Distribution by Sub-Region of Trip Origin (South of Fraser) from 2011 Metro Vancouver Regional Trip Diary Survey - Analysis Report. Select map to enlarge. In Surrey and White Rock, these projects will only help 18% of all trips being made at most. If you happen to be in the 82% group, the province’s transportation plan will not do one thing to help you. While it is important to look to the past for guidance, we shouldn’t be building our transportation network based on plans from the 1990s. One of the things that we are told is that buying local is good. The provincial government has a B.C. Buy Local program which reminds us of this fact via adverting throughout Metro Vancouver. 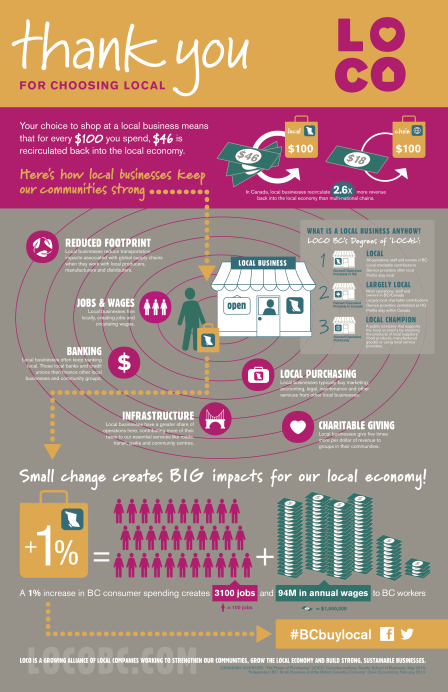 "Why Buy Local" infographic from LOCO BC. While we’re told that buying local is good, we are also told that free trade is key to ensuring a successful Canadian economy. While non-local businesses can now access local markets easier, free trade agreements in theory also make it easier for local businesses to gain access to non-local markets. This almost seems like a paradox. Should we be buying our apple from the Okanagan, or the free trade apples from Washington State? Should we be buying Ikea future, or quality goods made locally? In 1995, the federal government, provinces, and territories signed the Agreement on Internal Trade. BC, Alberta, and Saskatchewan signed the New West Partnership in 2010. These agreements bar local governments, provincial governments, and their various agencies from preferring to procure local goods and services in some cases. Metro Vancouver staff recently put together a memo for its Performance and Procurement Committee about buying local and trade agreements. While the memo doesn’t say is these are local offices of larger national or international organizations, it is telling how important a local presence is. I find it interesting that the BC government spends money on adverting telling us to buy local, but has signed agreements which prevent governments from preferring local businesses. Back in 2013, Christy Clark announced that the provincial government would replace the Massey Tunnel with a new bridge. On the surface, this seemed like a good idea as the Massey Tunnel is a bottleneck during peak travel periods. For a bit of a history lesson, Time and Tide: The Settlement of Lulu Island’s South Arm Shore from the Richmond Archives explains why a tunnel was originally built. 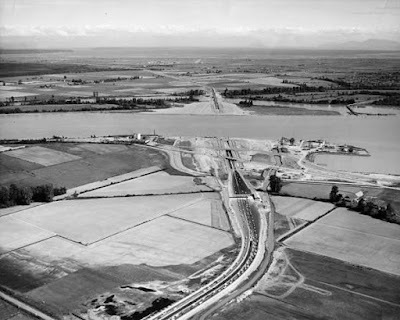 Mr. Massey had promoted, researched, lobbied and spoken to any interested persons on behalf of building a tunnel underneath the Fraser River at the site of the Ladner Ferry terminal. Among his arguments in favour of a tunnel instead of a bridge were that the approaches for a bridge would be so long as to be wasteful form a land use point of view, and very expense to build. Further research by consultants hired by the province in 1955 found that a tunnel would cost $152.2 million (2015, inflation adjusted) as opposed to a bridge which would cost $214.8 million (2015, inflation adjusted). A bridge was 41% more costly than a tunnel! Another challenge with building a bridge is the soil conditions in the area. A presentation for the UBC course EOSC 547, Tunnelling and Underground Engineering by Robert Cross, notes the soil conditions around the Massey Tunnel and construction methods used to build it. Knowing the history of the area, it is no surprise that the proposed Massey Bridge is now going to cost north of $3 billion, and will likely be over budget. To put that $3 billion into perspective, the whole Mayors’ Council Regional Transportation Investment Plan for Metro Vancouver costs $7.5 billion with benefits throughout the region. Building a bridge across the Fraser River at Deas Island was a bad idea sixty years ago; the reasons for it being a bad idea haven’t changed 60 years later. 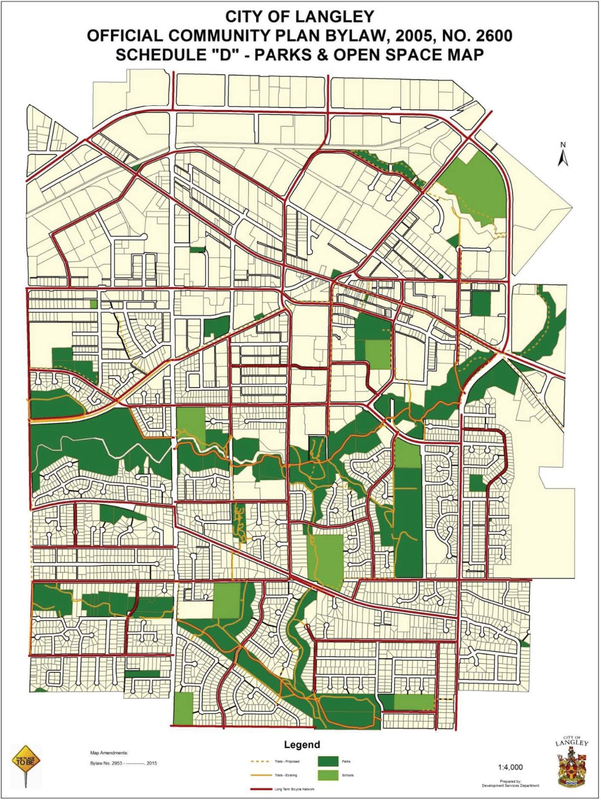 Last year, the City of Langley updated its Master Transportation Plan, and Parks, Recreation and Culture Master Plan. Because of the age of the City of Langley’s current Official Community Plan (OCP), an update is required to reflect the content of both of the two new plans adopted in 2014. Both the Parks & Recreation section of the OCP, and the Transportation section received significant updates. One of the major goals in the Park & Recreation section of the updated OCP is to enhance trails, paths, and sidewalks in the community. This includes working on developing a trail system along Logan Creek near Kwantlen Polytechnic. It also includes updating wayfinding and trail infrastructure such as lighting, benches, bike racks and public art throughout the community. Another major goal included in the OCP update is to acquire more parkland for neighbourhoods north of the Nicomekl River. 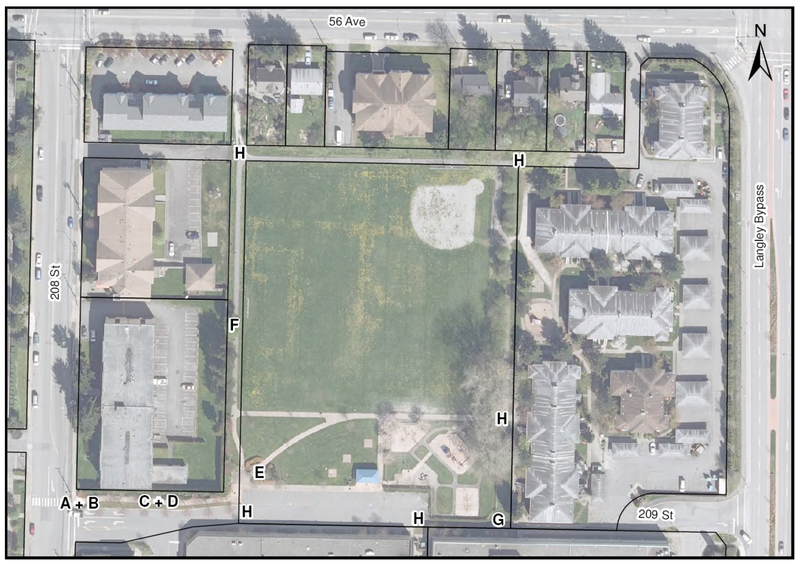 As safety is a major concern in Langley, the OCP also speaks to using Crime Prevention Through Environment Design to improve the safety of all City of Langley parks. Within the updated Transportation section of the OCP, the biggest goals are to improve the walking and cycling network in the City. This includes expanding both the cycling and sidewalk network, as well as enhancing the quality of existing cycling and walking infrastructure. 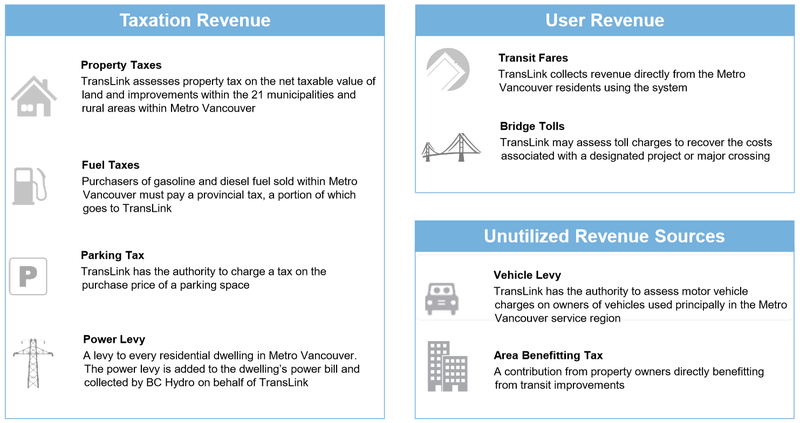 While the OCP update also includes information about the future transit network, it is the responsibility of TransLink; there is very little the City can do to improve the transit network on its own. 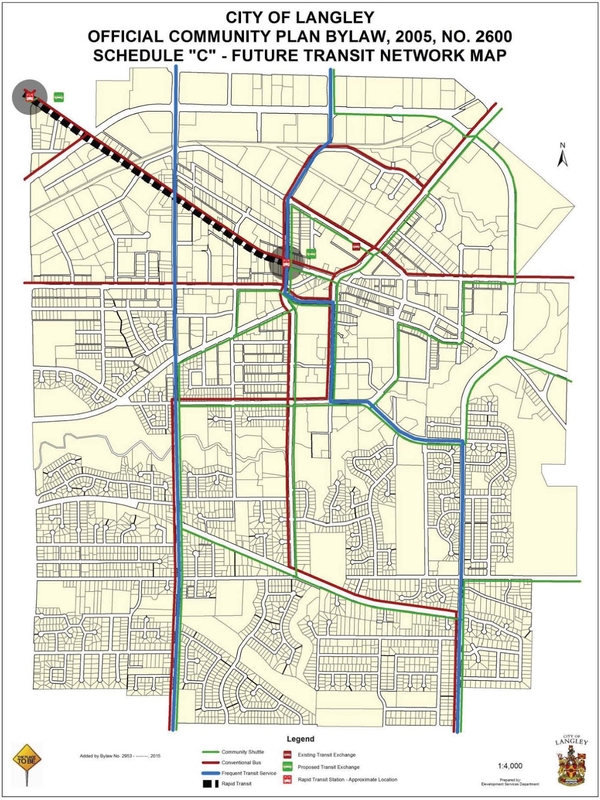 As far as major road widening projects, the OCP identifies sections of 200th Street, the Langley Bypass, and 62 Avenue as candidates. The 50 Avenue/Grade Crescent/200th Street intersection has also been identified for a major upgrade. The public hearing for the OCP update was last night, and it is very likely that this update will be approved at a future council meeting. I have shared some of the updated maps from the OCP below. Schedule "B" - Road Network Map. Blue = Province, Yellow = TransLink Major Road Network, Red = Arterial, Green = Collector. Select map to enlarge. Schedule "C" - Future Transit Network Map. Rapid transit route and stations along hashed black line. Frequent transit network in blue. Local bus service in green and blue. Select map to enlarge. Schedule "D" - Parks & Open Space Map. Includes future cycling network. Select map to enlarge. Every so often, a planning guide is released which is a real game changer. 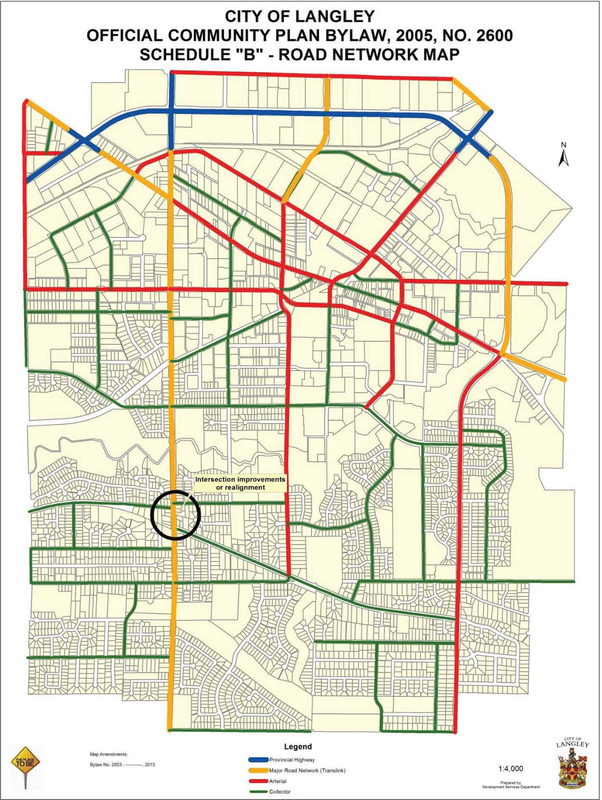 One of those guides is the Urban Street Design Guide which shows how local governments can build streets that support all ages, abilities, and modes of transportation. 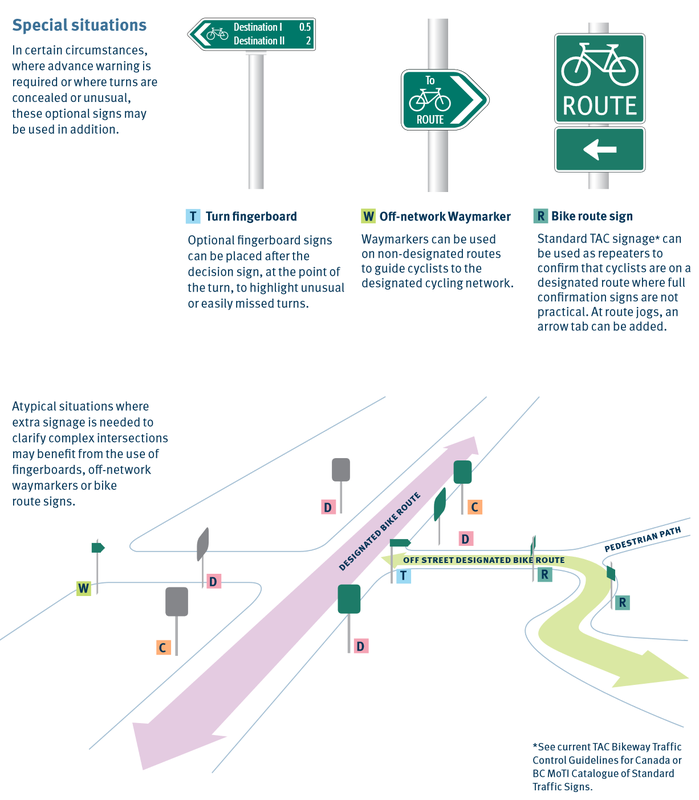 Another game changer, released just this month by the Massachusetts Department of Transportation, is its Separated Bike Lane Planning & Design Guide. Over the last few years, many forwarding-thinking communities have come to the realization that people will only cycle if they feel safe. Building protected bike lanes creates a safe environment for cycling. One of the barriers preventing the widespread adoption of protected bike lanes in North America is the lack of a comprehensive, and easily understandable design guide. 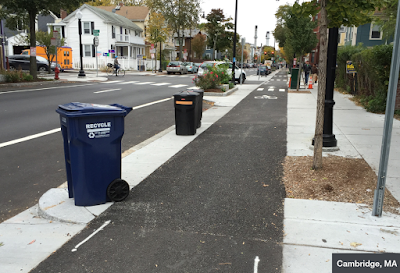 This is where the MassDOT Separated Bike Lane Planning & Design Guide comes to the rescue. It not only provides design advice for transportation engineers and planners, but it is visual enough that local government decision makers will also understand the guide. The guide is divided into seven chapters. There is one chapter that covers general design, and another full chapter dedicated to intersection design. Intersections are where the majority of conflicts between all road users occur. Comparison of Bicyclist Exposure at Intersections. Cycling movements in blue, auto movements in black. Select diagrams to enlarge. 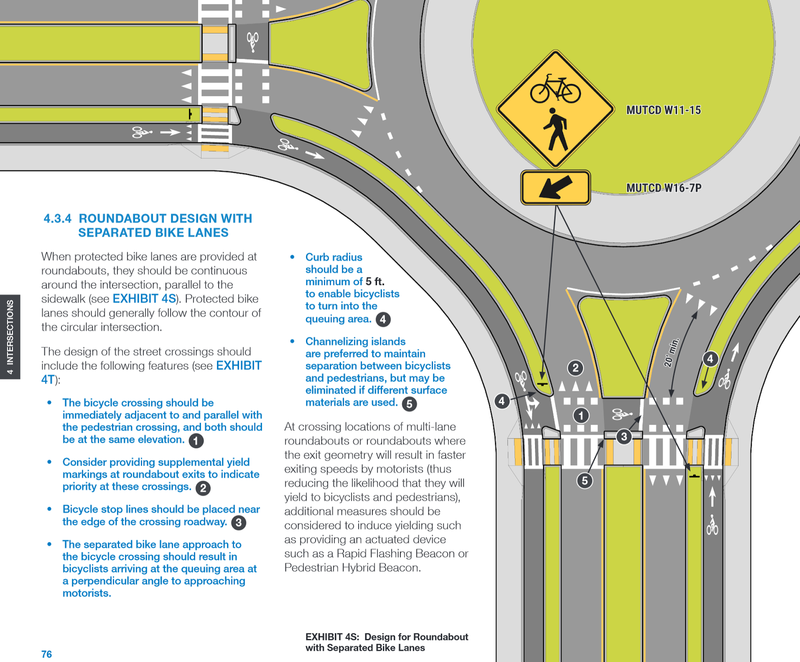 The design guide contains examples of protected bike lanes going through all types of intersections. An example of how to build protected bike lanes through a roundabout. Select example to enlarge. While building protected bike lanes is key to getting people riding bicycles, those lanes must be maintained to ensure their long-term success. 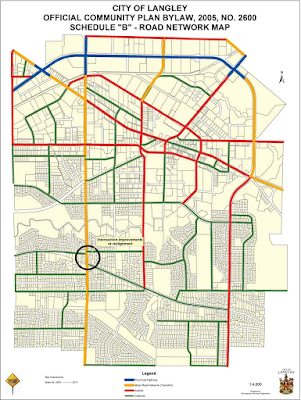 The Separated Bike Lane Planning & Design Guide’s chapter on maintenance covers everything from lane sweeping and snow removal, to how to plan for solid waste collection. An example of planning for solid waste collection on a residential street with protected bike lanes. The MassDOT Separated Bike Lane Planning & Design Guide is a must-read for anyone involved in the design, construction, or maintenance of streets: from politicians to engineers. 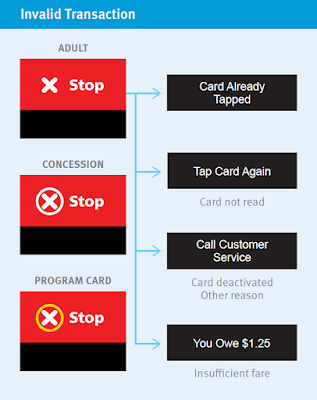 Compass Card: improving customer service, or tracking transit riders? Since the beginning of this month, I’ve swapped out my old paper monthly pass for a Compass Card. As I’ve been tapping in and out of the system this week, I’ve been thinking about the benefits and challenges of the Compass Card smart card system. The whole Compass Card project started when former Minster of Transportation Kevin Falcon decided that Metro Vancouver needed fare gates. Cubic Transportation Systems, the maker of fare gates and our Compass Card, was lobbying the province at the time. Most people think that the Compass Card was needed to implement fare gates. This isn’t true. The magnetic fare media technology that TransLink has been using for years would have also works. New York’s MTA uses the same magnetic fare technology as TransLink to let people into the busiest subway system in North America. Kevin Falcon’s desire to have fare gates could have been accommodated without needing the Compass Card. Most regions in North America look at implementing smart card systems because of improved customer service. In the Los Angeles region, their tap Card allows transit riders to use 20+ transit agencies without having to worry about exact cash fare, or carry around multiply tickets and passes. This story is the same for regions along the West Coast including San Francisco and Seattle. Smart card systems make riding transit way easier in these regions. There are other benefits too, like being able to load up your smart card via a computer or mobile phone. There is only one transit agency in Metro Vancouver, so the biggest benefit of smart card systems —the ability to use one card for multiply agencies— isn’t present. While I like the ability to load my card up online, it is also super easy to walk to one of the hundreds of retail outlets that sell passes and tickets throughout the region. If I’m being really honest, it was actually more convenient for me to flash a pass on a bus than use a Compass Card. The Compass Card brings huge benefits to TransLink. TransLink can know exactly how people are using its transit network. This information will allow TransLink to better provision transit services as they will be able to match service with demand. The Compass Card is also a more secure fare media system which will help reduce fraud. What really impresses me about the Compass Card system is that within minutes, I can look online and find out what stop I tapped in and what stop I tapped out at. TransLink can get a real-time view into ridership throughout its network. Most regions look at implementing smart card systems to improve customer service, ridership data is secondary. When I look at the implementation of the Compass Card system, including its delays, it appears that a primary driver for the Compass Card system is to get ridership data. If ridership data was a secondary objective, TransLink could have gone with a tap on-only system for its buses. In other North America cities, you tell the bus driver how many zones you are travelling before tapping your card. 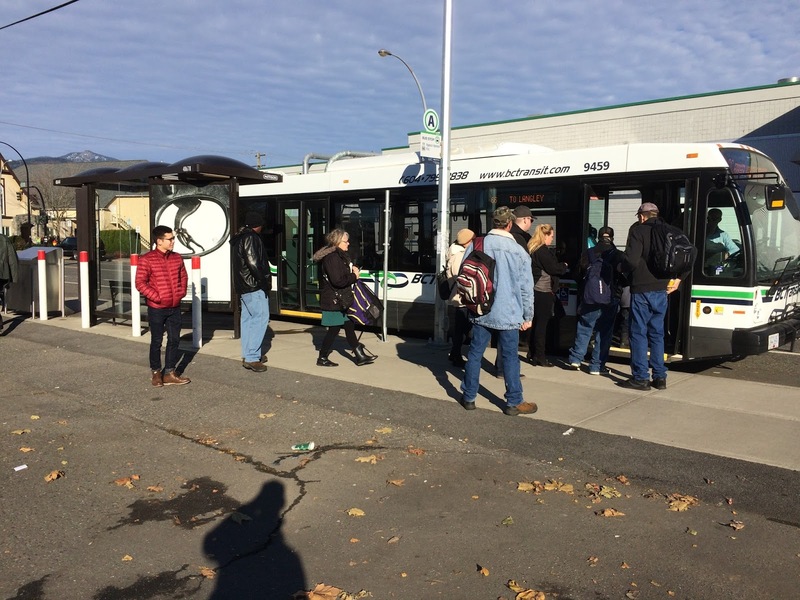 Tapping out of buses is what delayed the launch of the Compass Card system in Metro Vancouver. Two readers can’t handle the rush of people leaving at busy bus stops like King George SkyTrain station. There are solutions to this problem, but those solutions decrease the accuracy of data about how people use the transit system. At busy bus stops, TransLink could install readers on the street. This would reduce the load on readers on the buses. TransLink could also install more readers on the buses, allowing people to tap off shortly before their stop. The slow launch of the Compass Card was one of the reasons why people voted no to more transit funding this spring. If TransLink wasn’t as focused on the data gathering aspect of the Compass Card system, would it have been launched before the referendum? Would that have changed the outcome of the vote? The Compass Card story should be a cautionary tale for other regions in North America. Customer convenience should be the only reason for launching a new fare media system. 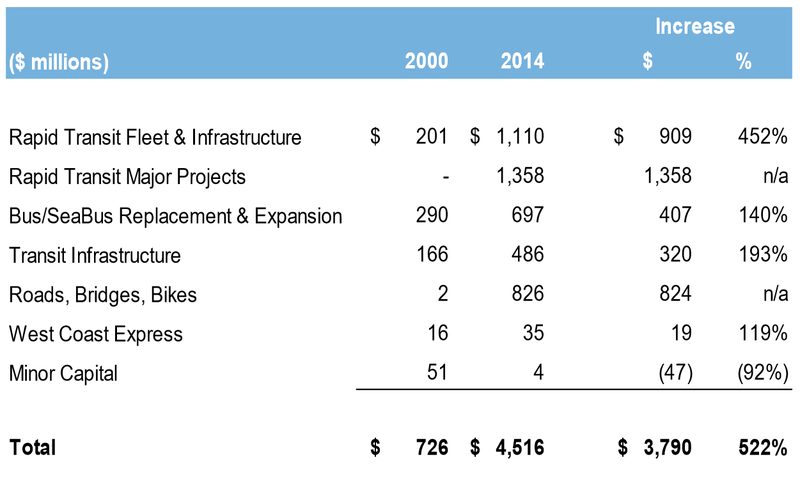 At the end of 2014, TransLink saw a small 0.35% increase in ridership. This was after seeing overall ridership drop starting in 2012. Unfortunately, 2015 has seen the continued drop in TransLink ridership. The American Public Transit Association has released the latest ridership numbers for participating transit agencies in Canada and the US. TransLink’s second quarter results show a 0.97% decrease in ridership from January through June 2015, compared to the same period in 2014. The Expo, Millennium, and Canada Lines saw a small 0.18% decrease in ridership. The West Coast Express saw a 0.98% increase in ridership. SeaBus ridership increased by 3.69%. The bus network, excluding trolley buses, saw a 1.23% drop in ridership while the trolley bus network saw a massive 2.25% drop in ridership. TransLink’s official reason for the drop in ridership is fare increases over the years have caused people to take transit less. While this may be part of the story, a lack of funding for transit has hampered TransLink’s efforts to address overcrowding on busy routes and the SkyTrain, and has prevented TransLink from expanding transit service to under-served areas. Around 17% of TransLink’s total ridership is from the trolley bus network. As I posted about this summer, bus ridership has actually increased in areas like the South of Fraser while it has decreases in Vancouver. 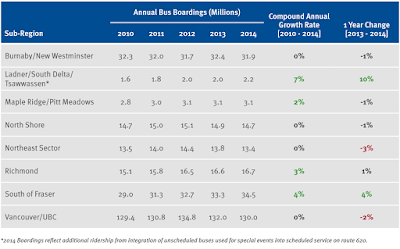 Annual bus boardings between 2010 and 2014. Select table to enlarge. Source: TransLink 2014 Bus Service Performance Review. Select table to enlarge. 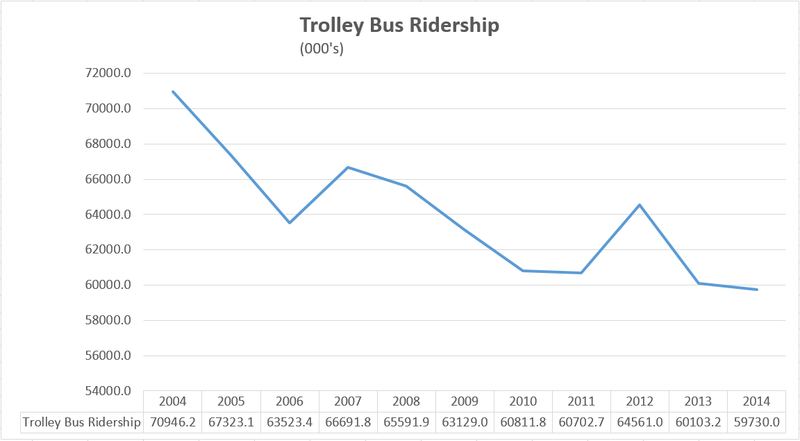 Unlike the overall transit network which only started to see consistent drops in ridership starting in 2012, trolley bus network ridership has being on the decline for the last decade. 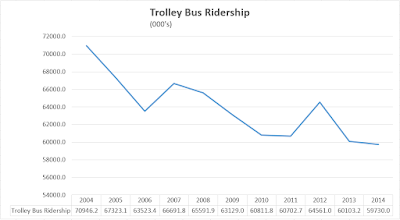 With this long-term decline in ridership, I’m surprised that more research hasn't gone into finding out why the trolley bus network is losing riders. Are people in Vancouver taking transit less because it is easier to walk or cycle? Is the trolley bus network no longer aligned with our modern travel patterns? 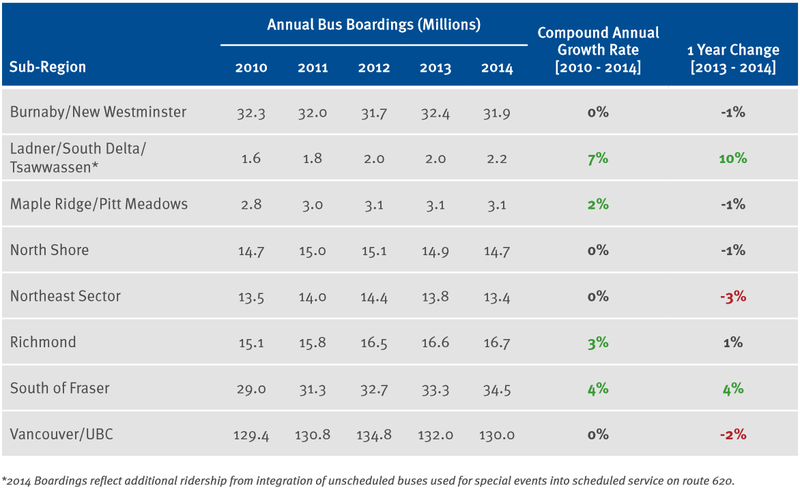 Trolley bus ridership between 2004 and 2014. Select table to enlarge. One thing that is clear to me is that TransLink and people living in the City of Vancouver need to have a serious conversation about the trolley bus network to determine if it is the best way to move people around in Metro Vancouver. Metro Vancouver is home to an extensive parks system, and hosts many protected or managed conversation areas. 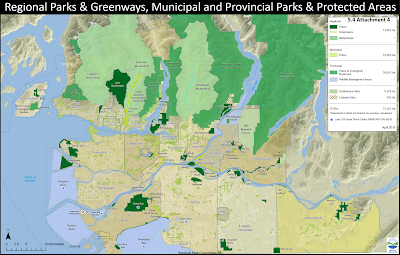 Besides municipalities, the province, and the federal government, Metro Vancouver is the steward of many of the largest parks in the region. Regional Parks & Greenways, Municipal and Provincial Parks & Protected Areas. Select map to enlarge. In the South of Fraser, Metro Vancouver operates Boundary Bay, Burns Bog, Tynehead, Derby Reach, Brae Island, Campbell Valley, and Aldergrove as well as other parks and protected areas. Metro Vancouver keeps track of visitor usage statistics for its parks system, and posts this information semi-annually. Recently, Metro Vancouver posted its statistics for the period between January and August of this years, comparing it to the same period last year. Visitation by park, January to August 2015 compared to same period in 2014. Select table to enlarge. While Pacific Spirit Park around UBC is the busiest park in Metro Vancouver’s network, the parks with the largest increase in visitor volumes are in the South of Fraser. 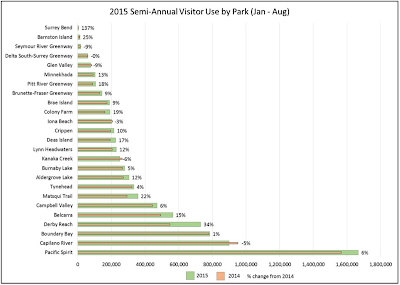 Surrey Bend is a new park, so it is no surprise that it has seen a 137% increase in visitor volume. Derby Reach, in the Township of Langley, is now the fourth busiest park in the Metro Vancouver network, seeing a 34% increase compared to 2014. While it is good that Metro Vancouver parks are well used, one of the challenges for the regional district will be to continue to protect ecologically significant areas of their parks as more people visit them. As parks like Derby Reach become more popular, Metro Vancouver will have to think about how people access these parks. How will Metro Vancouver encourage more people to visit their parks by walking, cycling, or transit instead of driving? Should Metro Vancouver be adding more parking lots to accommodate growth? At Derby Reach, should Metro Vancouver provide a seasonal bus shuttle service between the park and Carvolth Park and Ride to accommodate the increase in visitor volumes? More detailed usage statistics about Metro Vancouver’s park system can be found starting on page 42 of the November 5th, 2015 Regional Parks Committee agenda.